I saw a lot of terrific performers in their element during Fresno’s 2013 Rogue Festival. In-between the “Apocalypse Clown!” shows Xan Scott and I performed, I managed to catch a dozen or so shows, nearly all featuring excellent touring fringe performers in engaging solo shows, improv shows, themed shows and such. Amidst these, I took considerable inspiration from the following shows. 1. 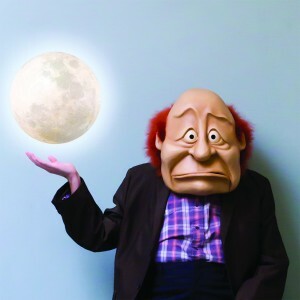 Wonderheads (Portland, OR) – Grant Knutson never passes up an opportunity to rave to anyone in Seattle (myself included) about this physical theatre + mask duo from Portland. With their company Wonderheads, Andrew Phoenix and Kate Braidwood specialize in mask and effects theater, effectively combining physicality, music and creatively designed props into a captivating cartoon-like story. This year, Andrew ran tech as Kate performed solo under the mask and baggy costume of a forlorn middle aged man looking for love (and the moon) in LOON. I trained and worked quite a bit with the Seattle clown community, and though clown work overlaps into other physical forms like mime and mask, these are mostly untouched forms and we don’t have communities of talented mask performers the way we have them in, say, improv or musical theatre. Kate offered a spectacular exhibition of a solo mask performer carrying an entire show, combined with the meticulous and innovative use of set pieces and props for transformative effect. Grant and I need to find a way to get Wonderheads to Seattle, and get them an appreciative local audience that will take inspiration from and run with the work they have forged. In a long line of good solo shows, multi-time best of fest winner Gemma Wilcox (a Brit based in Colorado) stands out because of her incredibly detailed and energetic physicality. In many solo shows, slow transitions and ambiguous character distinctions can sap the energy out of an audience and a show. But Gemma’s mastered the art of solo performance and makes it clear how she managed to win so many best of awards around the world. 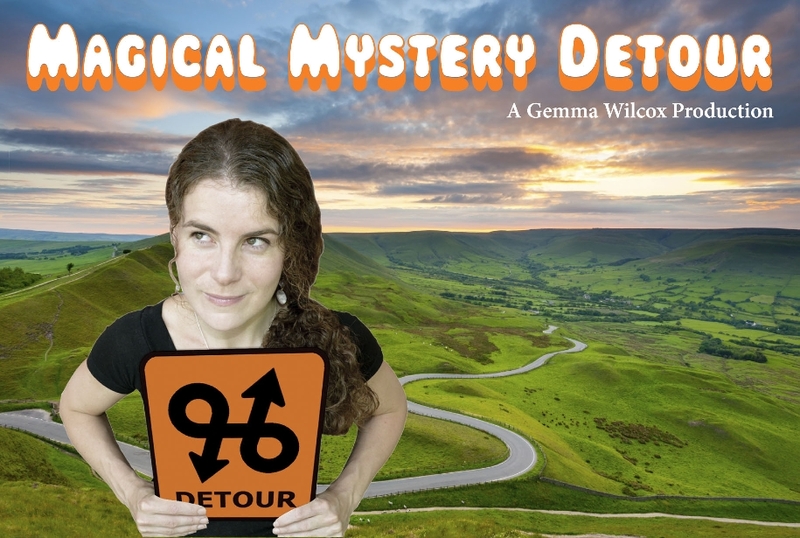 In “Magical Mystery Detour”, a tale of a woman coming off a breakup who gets lost on a trek to fulfill her dead mother’s last wish… Gemma moves briskly and seamlessly through her story and between 25 different characters, many of which are animals, side characters and inanimate objects (e.g. a Scotland-made car with a Scottish accent, a flittering fly with an eye for puke-feeding detail, a Neti pot with an Indian dialect, British currency speaking in the manner of the Queen, even the hand waving Queen of England herself). While Gemma’s not necessarily re-inventing the wheel with her excellent shows (the festival scene is full of great solo shows)… her polished attention to detail, and the way with which that discipline makes her work as great as it becomes, is an inspiration. This is not a performer who figures out what is needed in the moment and settles for doing that. She finds and measures every bit of performance value in every little spot she can. Martin Dockery‘s shows always sell huge and, no, his storytelling shows don’t necessarily reinvent the wheel either. But watch a Martin Dockery show and it quickly becomes clear why fringe fans flock to his shows. Martin’s unrelenting physical, vocal and emotional commitment to his storytelling combined with his distinctive flailing yet communicative physicality makes him entertaining to watch almost regardless of what he’s talking about. Seriously, even with just a chair the man needs at least a 15-20 square foot radius of space given how physical he gets with his storytelling. “Bike Trip” is a curious exploration of his travels to Europe to relive the experience of the first man to ever take LSD (and yes Dockery himself is no stranger to trips with the psychedelic drug). While he alone is a draw by himself, Dockery’s story made a good show great… even if it did run a bit long past the 60 minute festival limit. 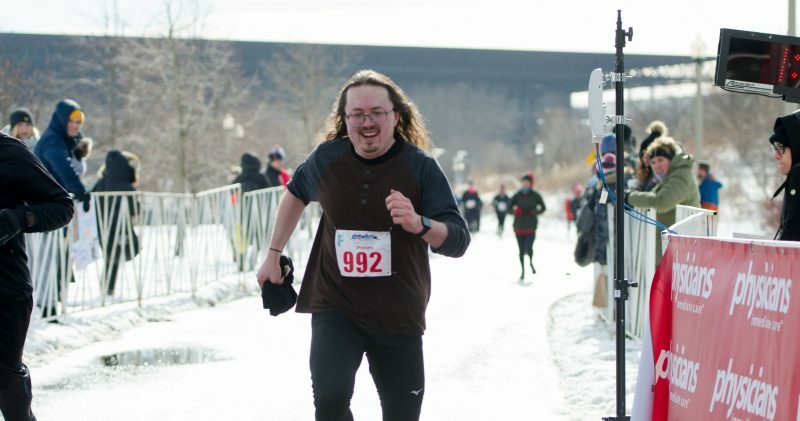 Dockery’s commitment, engagement and passion in what he does is an inspiration. There were a small handful of dance shows at Rogue. I saw one other dance show, from local company NOCO, and they did a fine job though I’m somewhat spoiled from Seattle’s excellent dance scene so I saw it through jaded lenses and wasn’t as impressed as I might have been had I not seen much dance. However, in “Ah! That’s My Dance Body!”, Megill and Company struck me in doing what virtually every other dance show refuses to do: It told a story and had a bigger message while retaining strong dance form in riveting dance pieces. The piece somewhat cartoonishly follows two dance novices who are hit with a dose of “you’re not good enough and don’t have the looks of a dancer” reality by a senior dance instructor (played by Megill). The rigidity of the instructor’s insistence on form eventually breaks down her dance group (themselves tired of the machinery of contemporary dance), and the resulting rebellion and self discovery leads to Megill’s character shedding her old identity and the group coming together to rediscover the reason they began dancing in the first place: Because they enjoy it. Yes, that’s a dramatically basic storyline, and not all that far removed in scope from the kind of stuff we in Seattle see from, say, DeLaCreme’s crew in “Homo For the Holidays”. But I was impressed that a dance show even HAD a storyline that wasn’t so much schlocky but made an actual attempt at social and cultural commentary. There is potential in taking this route, and rather than avoiding this route as most choreographers do… Megill and Co are embracing and travelling it. No matter how their form and technique stacks up with other companies (and honestly their form/technique was pretty strong), I’m more interested in their effort to explore undiscovered country in their work, and respect them greatly for this effort. 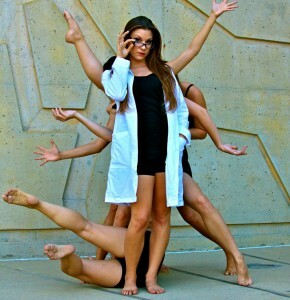 Jenna Bean Veatch’s “Sideshow” scratched this surface of dance engaging theatrical narrative. I was sad to see that, while the Seattle dance community came out to see Sideshow… our dance community mostly ignored that crossover possibility and went back to indulging form/aesthetic-heavy dance pieces that avoid theatrical narrative like the plague. All you can do to change the direction of a culture is to embrace and promote what you want to see. I am happy to see a group like Megill and Co promoting this promising direction in dance. Rogue featured a small handful of improv groups, and I honestly didn’t think much of the possibility of seeing Blimprov. But they were a friendly group and they were clearly quite popular among the locals: All their shows sold out the 50 seat Broken Leg Stage, in fact, even after they added a late Saturday show on the closing weekend (which I got to see thanks to Broken Leg owner KP and Blimprov leader Nick Haas). Still, I wasn’t sure what the big deal was, and as I sat down I merely hoped for a decent improv show. What I saw was a spectacular exhibition of how spontaneous and fun an improv show can be. 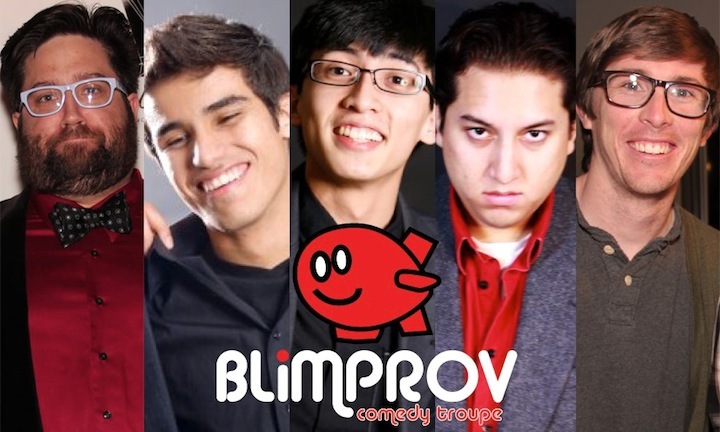 Blimprov clearly left any insecurities at the door and focused on playing and HAVING FUN. Their show didn’t reinvent the wheel either: They did an Armando (long form improv build around material from monologues presented by a special guest), and closed with a fun short form guessing game called Schoolyard Bully. The show featured a lot of strong choices and no fear of left-field offers. Nick Haas, Anthony Taylor and Magnus Chhan in particular took joy in monkey-wrenching scenes with relevant but crazy offers that vaulted scenes into crazytown hilarity. The scenework was strong, driven and committed: Even when they let scenes run a bit long, the offers were so strong, spontaneous and funny that they hooked us all the way and the eventual edits felt like they came too soon. I had an injured rib, and by the halfway point Blimprov had me in such pain from laughing so hard that I had to momentarily turn away and ignore the proceedings for my own sake. Seattle has a huge improv scene with lots of groups of varying quality, featuring some of the best improvisers I’ve seen anywhere (including Chicago, the improv center of the world). Blimprov could move to Seattle tomorrow and be one of the city’s best improv groups right away. Their fearless and fun improv needs no bells and whistles, and they could teach the community a thing or ten by example of what improv is all about.